Elliot Knight stars in OUAT. Photo Credit: Isaac Sterling Photography. Emma Swan (Jennifer Morrison) looks a bit different this season. Her glossy blonde hair has turned frosty, her clothes range from different shades of black, and she seems to have no problem killing her friends. Meet the newly christened “Dark One” that’s terrorizing Storybrooke and refusing to give answers about the town-wide memory loss. Merlin, the most anticipated character of Once Upon A Time’s season five, may be the only solution. In the second episode, Emma and her family travel to Camelot and discover that Merlin is imprisoned inside a tree. Merlin’s prophecy is that The Savior, formerly Emma, can free him. When King Arthur (Liam Garrigan) asks who The Savior is, evil queen turned good egg Regina Mills (Lana Parrilla) volunteers so Emma won’t have to use dark magic to release him. While the rest of the episode involves stabbing, a kidnapping by a demon, and Henry (Jared S. Gilmore) talking to his first crush, Merlin remains stuck in the bark. Since OUAT’s characters have yet to meet Merlin, GALO talked to English actor Elliot Knight to get details on the wizard’s upcoming appearances. Last year, Knight appeared in another ABC drama, How to Get Away with Murder, as Aiden Walker. At this law school, Professor Annalise Keating (Viola Davis) quizzes students on how criminals can get away with heinous crimes; meanwhile, real life murders are being committed on campus. Aiden is engaged to one of Annalise’s students, Michaela Pratt (Aja Naomi King), and it’s revealed that he has a secret romantic past with one of her classmates (it’s still rather unclear whether he’ll return for season two). Knight also played the lead in Sinbad, a popular adventure series on the UK’s channel Sky 1. After live-tweeting OUAT’s premiere on Sept. 27, Knight spoke with GALO about how he looked up to Merlin as a kid, what role his character has in the OUAT cast losing their memories, and whether Merlin may have a dark side. GALO: I actually watch both How to Get Away with Murder and Once Upon a Time, so I’m really excited to talk to you today. I saw that you live-tweeted the West Coast’s OUAT premiere. The show’s fan base is notoriously passionate and it seems like you really connected with them. What has it been like interacting with OUAT fans for the first time? Elliot Knight: [Laughs] More like I tried to live-tweet! Whenever I’m in America, I forget about the different time zones and that some people saw it three hours ago — but I tried my best. I was also trying to watch it myself because I hadn’t seen it yet. The fans are amazing; it’s incredible how much they know about the OUAT universe and they’re so committed to it. They’ve been so kind to the new cast members, myself included, and it makes the job all the more enjoyable. GALO: Is live-tweeting something you’ve done with past shows that you’ve appeared in? EK: Here’s the thing about me: I’m terrible with Twitter. I haven’t fully understood how to use it. It’s only recently that I said to myself that I need to make a solid effort with this. I need to be on it and do a good job, or I won’t be on it at all. To be honest, I would rather watch the show and tweet about it afterward. I figure that maybe I won’t do this every episode, but for the premiere, I gave it a go. EK: [Laughs] Every time I went to tweet something, something else crazy happened and I forgot what I wanted to say before. 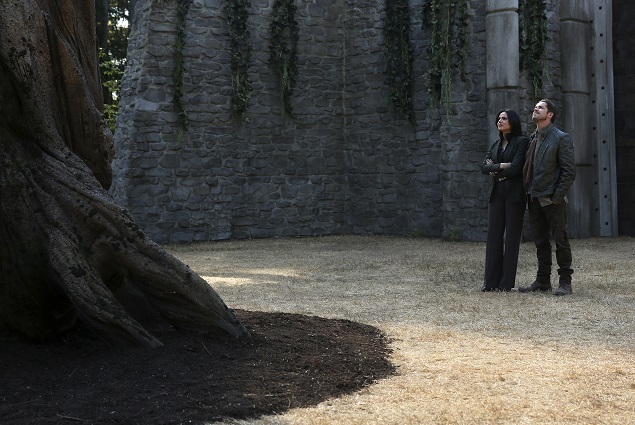 OUAT season 5, episode 2: “In an effort to protect Emma, Regina (Lana Parrilla) steps up in a surprising way that will test her mettle as a force for good.” Photo Credit: ABC/Jack Rowand. GALO: It was a solid effort. Are you a fan of fairy tales or did you have to do a lot of Merlin research to get a feel for how to play him? EK: God, I’m a huge fan of fairy tales — just like most kids, magic and imagination are such a theme when you’re growing up, you know? I have a little sister but she didn’t come around until I was nine, so I had a lot of time where it was just me. So a lot of times when I played, it was on my own and it was with magic things; it was the most fun. There was a TV movie in the UK called Merlin. It had Sam Neill, Isabella Rossellini and Helena Bonham Carter, and I loved it. It was a grown-up Merlin that went deep into Stonehenge, Queen Mab and the Lady of the Lake — all of which I found fascinating. So Merlin was a character that I held in high regard and was kind of in awe of since I was a kid. Getting to play him now is wonderful. GALO: Absolutely. Was it challenging to take on a role that is traditionally played by someone elderly? How did you make it your own? EK: [Laughs] I think it would have been more challenging if that’s what I was trying to do, to play an 80-year-old with long, white hair. Yeah, I would have had my work cut out [for] me. But I like how OUAT doesn’t approach Merlin in a classic sense, and we know how much this show likes mixing things up and throwing in a twist. I’m definitely not like the previous Merlins — I might be the first black Merlin, I don’t know officially (we checked and as far as film and television goes, he is!). With casting, it’s the role I wanted to play but wouldn’t have expected since I’m not the classical imaginings of that character, so I’m so grateful. When the show asked to meet me with this character in mind, I really appreciated not only them considering me personally, but having the creativity to think outside the box. GALO: Coming back to how you had seen Merlin on TV previously, why do you think Merlin has remained such an iconic character throughout film and TV? EK: Merlin, Dumbledore, Gandalf — people have that attraction to magic, no matter what age you are or where you’re from. What’s interesting with legends and mythological tales is that there aren’t really that many characters that actually conjure the magic and are the heart of magic. Merlin was pretty much the only magical force for good that existed around the time when these stories were being told. It was always about how magic affected other people. But what’s so interesting is asking how does magic affect the person that is actually magical? OUAT Season 5, episode 1: Emma Swan (Jennifer Morrison) rips Merida’s (Amy Mason) heart out as she battles the darkness growing inside her in her family’s presence. Photo Credit: ABC/Jack Rowand. GALO: In season five’s premiere, there’s a flashback to Emma’s childhood as Merlin tells her not to eat the candy bar she stole. We’ve seen that a lot of traditionally “good” characters in OUAT have dark sides. Is Merlin the one who retains true light and goodness? EK: I would say that everybody has a dark side, and there is no one more aware of that than those at the higher ends of good and evil. With that power and responsibility comes an appreciation of choice. That’s a strong theme of the season, if I’m not mistaken. Cinderella and Snow White are classically one thing. But what’s so wonderful about this show and what makes it so appealing is that the characters don’t just show the virtues; they show the vices as well. That’s what makes a person human, adding layers and dimensions. People can be good or evil depending on the situation they’re in, but [in] the end, people act on the intentions of their own hearts. That said, Merlin…well, we’ll find more about Merlin as we go. I wouldn’t say he’s exempt from those rules either — even as the most powerful sorcerer. GALO: Henry (Jared S. Gilmore) is a character that has learned how to make his own decisions in the fight of good versus evil. In season four, he proved that he was a good author candidate by breaking the magical pen, making him unable to write a happy ending for his family and friends. Is Merlin someone that Henry will be able to trust immediately or will his mysterious ways make him question Merlin’s integrity? EK: The great thing about Merlin is that no one knows what to expect, and that goes for the cast as well as the fans of the show. No one knows when he’s going to pop up, where he’s been or where he’s going. In the world of magic, things can be very cryptic at times. It’s not just about the answers, though; it’s about the journey along the way. And that’s the most cryptic thing I’ve ever said to anyone [laughs]. GALO: In the premiere, we find out that six weeks have passed since Emma’s family has lost their memories again. Does Merlin have a hand in bringing them back? EK: I can’t tell you that! What I’ll say is that Merlin is definitely a part of the events of what happens in those six weeks. Definitely. Whether or not he’s responsible for them coming back or anything like that, I can’t say. Which is a mixture of withholding information and not knowing fully myself, if that makes you feel better. OUAT found their Merlin in Elliot Knight. Photo: Isaac Sterling Photography. GALO: That makes me feel a little bit better. So most characters on OUAT seem to have a complicated love life, what can we expect from Merlin? EK: Personally speaking, I like to think that magic is very closely tied to emotion. When I was approaching this character, I knew that he was the most powerful sorcerer that’s ever existed. So he definitely needs to have a strong foundation; he has to have a story that grounds itself steadily and heavily in his emotional journey. We’ll find out more about him and how he comes to be how he is. GALO: Switching gears a little bit, you played Sinbad on Sky1. How did this role prepare you for your first network role as Aiden on How to Get Away with Murder? EK: [Laughs] Not at all! That’s not entirely true, but those roles couldn’t be more different. Sinbad was one of the best years of my life; it was my first ever job and it was such a valuable year for me as a person and as an actor. I was 20 years old when I started doing that and it was the best crash course into TV. I love HTGAWM and I love that character, and I’m really excited to see if they’re doing any more of it. But Aiden was a kind of character that wasn’t just there to fill a hole, these are characters with real, heartfelt stories, and he was a very sensitive character. I like playing good guys — my mum likes seeing that, too! If I’m lucky as an actor, I’ll get to do a range of different roles. At the same time, I like playing characters that have heart to them. GALO: What do you think about Shonda Rhimes as a producer and her goal to create more minority roles on television? EK: I mean, she’s brilliant — I’m happy her efforts are being so well noted [all] over the industry, and I’ve always been a big fan of Viola Davis (HTGAWM). Shonda is doing a great thing in making sure there’s an opportunity for people who might be struggling to find it. But they are roles that are written not just to tick a box on a sheet, or to fill a hole or please a percentage of the audience. That’s not what we’re interested in. We want the storytelling. As an actor, you just want to be part of telling a great story. GALO: In your upcoming movie Take Down — in which you star opposite Ed Westwick and Phoebe Tonkin — your character, Marsac, is taught boot camp survival skills. Did you have to ramp up on physical training of any kind for this role? EK: We did, actually. We slept in a cave, on a beach and in the middle of the forest, all in very different conditions (including torrential rain). No tents. All we had was a sleeping bag each and one plastic cover. We learned to forage for our own food and weirdly found lots of garlic lying around. I actually really enjoyed it! It was so awesome to be in nature — just basic human interaction with no phones on the island. You just have yourself, your friends, a couple of rocks and [you] just go. Survive. GALO: I’m sure that fully prepared you for the movie. Or if you ever end up stranded in the wilderness, you now have the skill-set for it. I even reckon Bear Grylls would give his approval! Are there any other current projects of yours we might not know about or that you’d like our readers to know? EK: Nothing I can talk about right now. I’m in the final stages of finding out something I might be involved with at the end of this year, but it’s too early for me to know yet. GALO: So we started this conversation with talking about Merlin and ended it with an ominous Merlin-esque statement! EK: [Laughs] Sorry, I tried to resist it, but it’s very difficult once [you’re] in character. Catch Elliot Knight on ABC’s “Once Upon A Time” when it returns for a third episode this Sunday at 8/7c or on ABC.com. 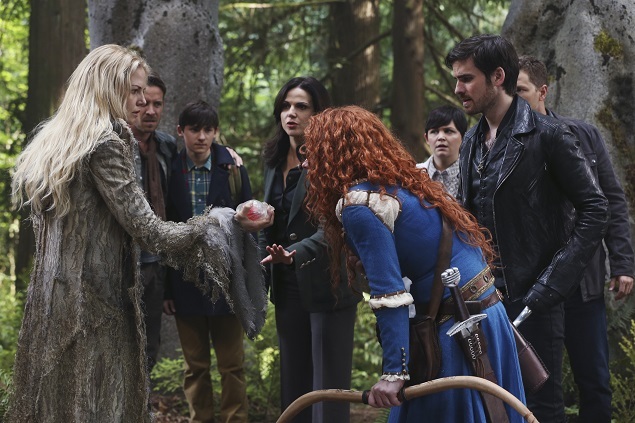 And as an extra treat, check out a sneak peek of Sunday’s episode below in which Hook goes on a date with The Dark One! For more information about Knight’s endeavors, you can follow him on Twitter @itselliotknight.